If your landscape includes a noticeable slope that makes it awkward to move from one level to another, one or more flights of garden steps can be the answer. Any number of building materials can be used to make garden steps, including poured concrete and natural stone, which can include flagstone, fieldstone, stack stone, and pavers. Professional landscape construction firms install many more stone stairways than poured concrete, because stone is often preferred by homeowners thanks to the natural, attractive appearance. But stone garden steps are difficult to install because of the sheer weight of the materials, and while some homeowners have tackled it themselves, the work is more often done by landscape construction professionals. A simple form of poured concrete garden steps is a more practical DIY project; but while the work is not complicated, it does involve hard labor; make sure you understand the process before tackling it. One reason landscape architects and design-conscious homeowners often prefer natural stone is that it looks much more natural in a landscape and offers more design options. While poured concrete tends to be a neutral gray (although it can be stained), stone comes in many different colors and textures to meet almost any landscape design aesthetic. Stone is also more durable, as concrete tends to crack over time unless it is laid perfectly; even then, some cracking is inevitable over time. With stone steps and pavers, it is fairly easy to replace individual stones, but badly damaged concrete steps need to be demolished and repoured. If a homeowner is looking to install a more formal outdoor stairway, then pavers may be a better choice because, with a rating of about 95000 PSI, they are much stronger than mixed concrete. For professional installation, concrete steps typically can cost nearly $300 per step, as opposed to about $150 for a stone step. While concrete as a material may be cheaper than stone, it's harder and more time consuming to install, requiring the construction of wooden forms and several crew members to pour and finish the concrete. On average, it takes a professional crew about two full days to lay concrete steps but only half a day for stone stairs. The prep and installation of concrete is also much more meticulous because there is more room for error. But for a homeowner willing to pour a simplified type of concrete garden steps, and who has willing friends to help, poured concrete can be less expensive than stone. Installing stone steps can be done in a fairly formal way, constructing them with efforts at being very precise in the height of the risers and depth of the treads, or they can be done more informally, with a minimal amount of excavation, where slabs of rock are embedded in the soil at regular intervals to make treads that essentially float. More formal stone steps require a considerable amount of careful measurement and calculation, and the excavation work can be considerable. A good landscape crew can do this work in a single day, and only the most intrepid DIYers should attempt it. More informal stone garden steps can sometimes be installed by DIYers, but be forewarned that these heavy building materials are not easy to move around and position. Here is an overview of how a typical installation might run. First, the width of the garden stairs is calculated. With large rock slabs, the width of the slabs might determine step with of the steps, but you can also place smaller stones side by side to achieve the same width. Generally speaking, any garden steps should be at least 3 feet wide, and 4 or 5 feet is a better minimum. Next, lay out the stairway on the slope with stakes and strings. Begin excavating for the bottom step first, using a spade to remove grass and cut into the slope to form a flat surface. Use the layout strings as a guide for setting the width of the excavation. Most garden steps are about 7 to 8 inches high and at least 12 inches deep. The depth should be somewhat oversized, since the subsequent steps will rest on the back tread portion of the previous step. Smooth the bottom of the excavation with a garden rake to flatten the surface. Position the rock (or rocks) in the space for the first step, making sure it is roughly level. If you are stacking layers of flat stone to achieve the proper height for the step, make sure the front face of the step is relatively smooth and uniform. Ideally, there should be a very slight forward pitch to the step to prevent water from puddling. You likely will need to systematically remove or add soil beneath the stone(s) until you have achieved a fairly level step. Once the first step is level, use a rubber mallet to pound on the top of the stone, "setting" it into the soil. Repeat this process for the next step, digging out the slope, flattening the excavation, then placing, leveling, and setting the stone(s) for the next step. Ideally, the second step should slightly overlap the back of the first step by a few inches Check with a level before continuing. Continue in this fashion for all the subsequent steps until you reach the top of the slope. 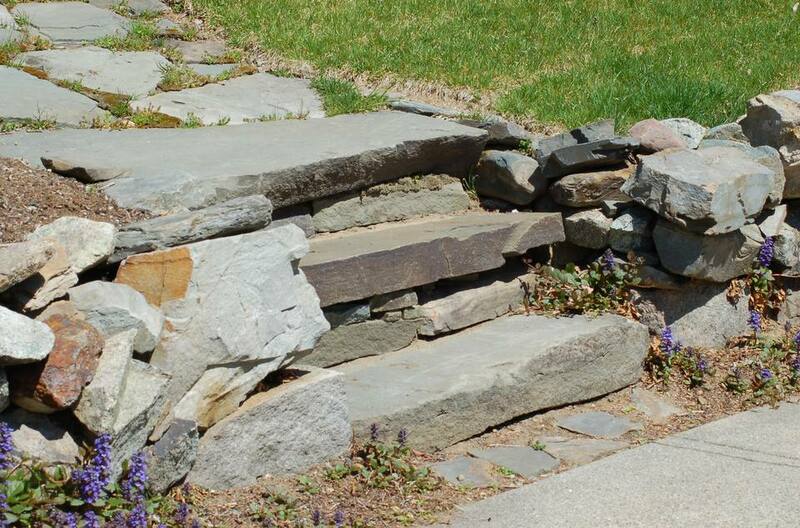 With a very gentle slope where it is not practical for each step to overlap the previous and rest directly on the stone, you can break up the stairway run into shorter flights of 2 to 4 steps, separated by wider landings made from flagstone or another stone chosen to match the color of the steps. Some adjustment of stones may be necessary after all steps are installed. Excavate more soil, or shim beneath low-lying steps with thin pieces of stone to create level surfaces. Planting ground cover plants around the edges of the steps and landings will help prevent erosion and anchor the steps. Concrete steps can be very formal, precise installations, best handled by a professional crew, but it is also possible to make a more informal, simple set of concrete landscape steps by using 1 x 6 or 1 x 8 lumber to create three-sided rectangular boxes 16 inches deep and 4 feet wide, into which concrete is poured. Here is an overview of the process. Cut the front and sides of the boxes, and joint them together with screws. Leave the back side open. Use a sledgehammer to embed each box into the ground with the open back side driven into the slope. Make sure the boxes are relatively level, with a very slight angle toward the front to assist with water drainage. Stake each side of the boxes to the ground to keep them in place, screwing the box walls to the stakes from the inside out. Add lengths of steel bar for each concrete step for added support. You will then use a continuous pour to fill each box with concrete. A pump truck is helpful for this type of project because using a wheelbarrow can be difficult and timing is essential. Work from the bottom toward the top, and use a trowel and edging tools to smooth the tops of the concrete steps as you go. Some people like to drive vertical lengths of rebar into the soil, with the top of the bar well below the top surface of the step. When the concrete is poured around them, these rebar "stakes" embedded in the concrete will help anchor the step in place on the slope. Once the concrete is fairly hardened but not yet fully cured, remove the boxes and smooth the edges of the steps using a round-over trowel. Any small voids in the sides of the steps or the front of the steps can be fixed by troweling on additional concrete. Railings are often not installed for outdoor garden steps, and code requirements vary widely. In many areas, there are no rules for steps that are not attached to a permanent structure, but in other areas, the rule may be that any flight of stairs with a total rise of more than 3 feet, or with more than 4 individual step risers requires a hand railing. Garden steps are often somewhat informal affairs with deep horizontal treads on each step and wide landings. The requirement for railings, if exists in your area, can often be easily avoided by dividing the total climb into a series of short flights 3 or 4 steps high, separated by wide landings. This also has the advantage of making the steps blend with the landscape more naturally. If the code requires a handrail, they should be stalled at a height between 30 and 37 inches above the step treads. For outdoor use, a good weatherproof material such as custom iron or cedar is a good choice. An outdoor garden stairway is one location where building materials can be effectively combined. Using pavers and stone together is one example, where pavers are used for walkways and landings, with natural stone for the steps making the transition between levels. Permanent landscape timbers are sometimes used for the framed of step boxes, with flagstone or poured concrete inset within the timber boxes.